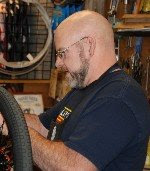 Our very own Don Barnett, from Century Cycles in Medina, will be teaching "Introduction to Bicycle Maintenance" for Strongsville's Community Education Classes. The class is on Saturday, October 18, from 9:00 to 11:00 a.m., and it costs $19 for residents ($23 for non-residents). Click here for class and registration info. This one-day class will provide you with some basic skills to help keep you rolling smoothly and safely and give you some tips to help you enjoy cycling more. Safety inspection and everyday maintenance are covered, plus emergency repairs including hands-on tire-changing, lubrication, and getting the most comfort and fun from your bike with appopriate position, technique, and accessories. Bring your bicycle questions.